We were supposed to get up early and go to the Vatican but we got a really late start today. Made our way to Termini station and got on a train. The north-south line is extremely crowded but thankfully the east-west not so much. Roman trains are packed like cattle cars with hot and sweaty people. People always talk about how bad Tokyo’s trains are at rush hour but in our experience Tokyo is nothing compared to Korea or Italy. We reached Vatican City. It was now 3pm and we were just starting our day. But first, lunch! We stopped by the first restaurant we saw and ordered a calzone, some bruschetta and ravioli. The Vatican ticket office closes its doors at 4 and we’re just watching the minutes tick by until it’s 3:45. Our food hadn’t even come yet. When it did, at least it was decent. I can say it was the best calzone I’ve ever had, so at least the food is getting better. Service in this country blows though. Once our food was finally served, I had to chase down a waiter to get his attention for more drinks. They never followed up once without my having to get involved. At least tipping is not a thing around here. Getting to the Vatican was a foregone conclusion at that point so we just enjoyed our meal and rearranged our schedule. In the meantime, we would at least scout out where the Vatican was. When we made it to the front gate, we rested for a minute before we realized where else we were. We were standing in front of the infamous Cafe Vaticano, a place so poorly rated on TripAdvisor and Yelp that it makes Amy’s Baking Company look like a 5-star restaurant. We felt compelled to waste our money and see just how bad it could possibly be (people on the internet get so dramatic) so we ordered two gelatos to go, since we didn’t want to get charged €15 for cups of iced sugar and a 20% service fee. It cost us €6, so takeout costs just a little more than other shops. It should be noted that they advertise lunch specials everywhere but there truly is no indication of the price. We looked and still didn’t see anything posted. In the food-service industries of first-world countries, hiding the price sheet and then charging exorbitant amounts for food and service fees would be considered fraud. In the healthcare industry, that’s just another Tuesday. I have to go inside to pay for food ordered curbside. Makes no sense. I pay John Waters’ doppleganger the 6 Euros and get the hell out of there. We sat and ate our gelato on the steps next to the cafe. I’m glad we ate outside. The view was much nicer than the one we would have gotten of that creepy dude’s molester mustache. So, food quality– they were less ice cream and more ice. Mine was stracciatella and hers fragella (strawberry). It really was poor for what we paid for it. Mine was just frozen milk and hers had freezer burn. Definitely not worth €6. If the quality of their gelato is any indication, things must be as terrible as the reviews say. The sad thing is that this their perpetual exploitation of pilgrims to the Vatican is allowed to happen in the shadow of St. Peter’s. So much for that Christian hospitality. Now that we knew where we needed to go tomorrow, we left to go check out the Circus Maximus. We found ourselves back near the Via Sacra, just walking along the outskirts. Along the way we passed by the Farnese Gardens but did not stop to check them out. Apparently these were the first private botanical gardens established in all of Europe. The weather here is abysmal for touring gardens or anything outdoors, really, but here we are just the same. Then we happened upon the Circus Maximus. Not much to see here, unfortunately, just a big sandy pit. Some ruins exist on one end but everything else has long been destroyed by the passage of time. Smaller equestrian games would have been held here. The land is big enough to create a ring for horses to run around but now it seems it’s only joggers and pedestrians doing it. There is no admission fee so anybody can just show up and do a few laps. 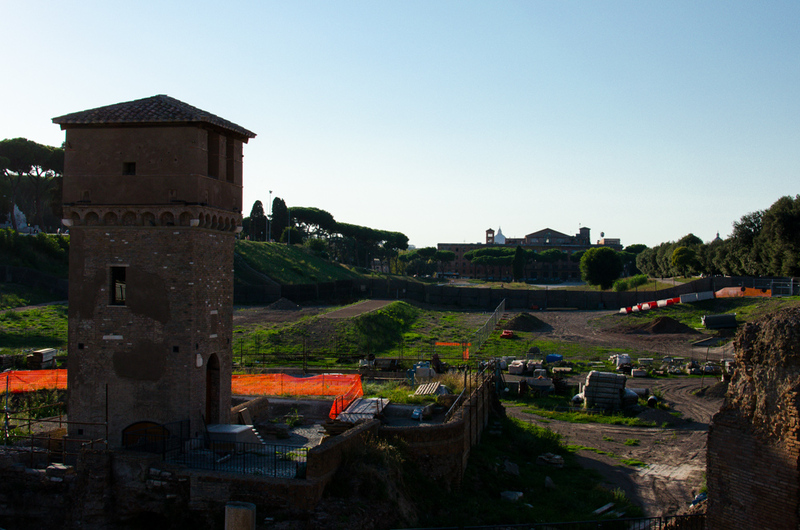 Across the street you can see the backside of the Roman Forum and Palatine Hill area. We had been there earlier in the week but this was certainly a new angle to see it from. Adjacent to it is the Temple of Apollo, which we must have missed while we were there. It’s massive. From the Circus Maximus we wanted to see how the plebes used to live in ancient Rome so we made our way down to the Aventine. Crossing the street, we passed by a strange monument that looked like Abraham Lincoln. It wasn’t Lincoln obviously, but this guy was cut from the same cloth. His name was Giuseppe Mazzini (La Patria) and he was an activist who worked to see the unification of Italy from its disparate states. The monument was dedicated to him.